Harmonic Music Studios is an awesome non-profit music store and education center in Washington D.C. They currently carry several of our models. Our hometown music store now carries all 3 of our models! Hop in to give them a try. Rose pickups makes the Jazzmaster-style singlecoils for the import Model2J here in the US. Fret Doctor makes the fretboard oil we recommend to keep our non-finished fretboards alive and lustrous. 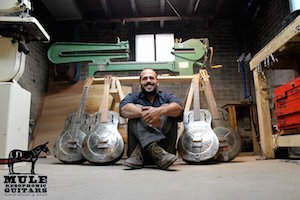 Maker of the, hands down, coolest resonator guitars on the market. Luthier, artist, mentor, and one of the most talented and generous human beings we know. The finest acoustic guitar builder we know. A truly undiscovered gem.